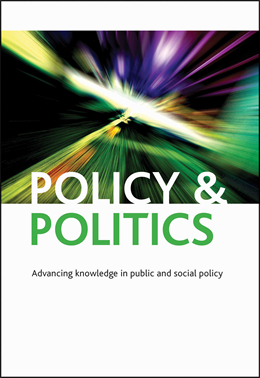 The April 2016 issue of Policy & Politics includes two articles about one of the most pressing issues facing contemporary public administration – how governments can successfully harness the resources of the private sector to deliver public services. The articles, by John Nicholson and Kevin Orr, and Chris Lonsdale et al., differ significantly in theory and method. The former is sociological and qualitative, examining micro-level working relations between public and private actors. The latter uses institutional economics and mid-range survey data to test hypotheses about public procurement processes. Yet, despite these differences, each article shares an interest in public-private relations. Nicholson and Orr’s focus is the role of, and relationship between, so-called ‘boundary-spanning’ actors – employees working at the intersection of different organizations and acting as intermediaries between them. Using structuration theory and a typology of governance ‘traditions,’ they explore the dilemmas faced by actors working across different cultural domains. They find that preconceptions and suspicions can be broken down over time, to foster collaborative public-private relationships built on trust and mutual reliance. Contrasting with this micro-level study, Lonsdale et al. test on a larger scale the idea that trust and reciprocity, rather than fear of supplier opportunism, can form the basis of more formalized, contractual public-private relations. From a literature review notable for its breadth and clarity, the authors elaborate these opposing views of the buyer-supplier interaction, and derive a series of hypotheses to be tested through a survey of procurement practitioners. The results are less positive than in Nicholson and Orr’s collaborative study, leading the authors to caution against a naïve approach to contract management that ignores the risks of opportunistic behaviour in public procurement. So, what inspiration can be drawn from these two articles? First, they both show that public-private engagement is complex and multifaceted, meaning that there are no easy answers to how governments should approach the issue. The potential is great, as are the risks. This inspires us to continue researching this important topic. Second, and more specifically, the differing results and levels of optimism about public-private engagements inspire us to develop a better understanding of the circumstances – or ‘contingency factors’ – in which successful cross-sector partnering is possible. This is crucial if research is to inform practice. Third, both articles, but especially the piece by Lonsdale et al, show the benefits of systematically applying well-established theory to new problem areas. Theoretical innovation is important and often necessary, but only if the current toolkit is found wanting. Hence, these articles inspire us to first make the most of the tried and tested tools already available to us. Dr Thomas Elston is Leverhulme Research Fellow in Public Administration at the Blavatnik School of Government, University of Oxford; and is a member of the Editorial Advisory Board for Policy & Politics.